Have you ever gone up to the attic and thought about better ways to use the extra space? Attic conversions will not only increase your living room, they can add value to your home if they're done right. Best of all, much of the work can be done yourself, which will save money and allow you to truly bring your own vision to life. 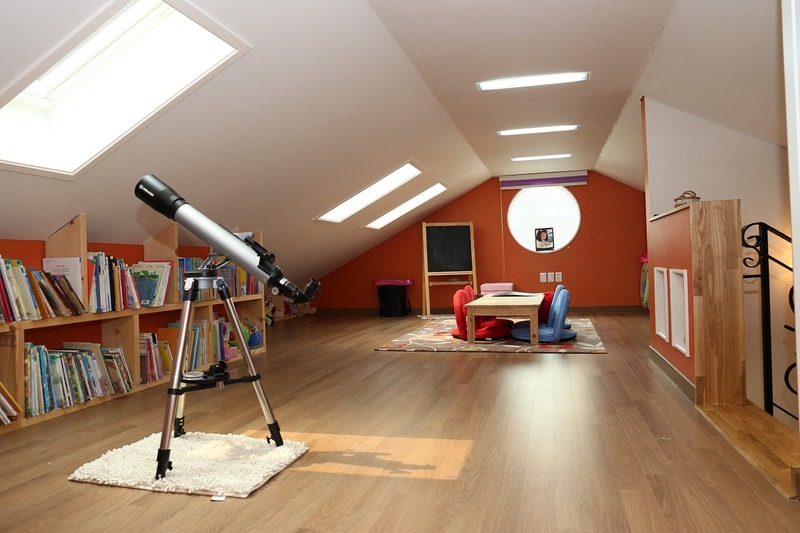 If your attic has a lot of headroom and adequate floor space, it can be converted. At the most basic level, the floor will need to be strengthened and reinforced, and you may need to add insulation. Any work that changes the height or shape of your roof may require a building permit; fire safety and first responder access are other considerations. Most attics contain the substructure for your roof and the beams from the original framing when your home was first built. Usually, this is where the insulation will go, and you can add drywall or paneling to create walls. However, some of the space between the eaves can also be used for built-in shelving, closets or dormers. The most classic attic remodels are spare bedrooms or home offices. However, the possibilities for your attic transformation are limited only by your available space, budget and imagination. A narrow nook may not seem to hold many possibilities, but some of the most beautiful uses of this space include reading rooms - for those times you want to getaway without leaving the house - and master bathrooms. Children's playrooms are also a good use of this space, and it can be updated as a game room or family TV room as your children get older. Most attic lighting comes from a bare bulb hung from the ceiling. If you're lucky, there may be one or two dormer windows. Installing skylights or additional windows will allow a lot of natural light into the space without increasing your electrical use. If your available wall space and plans for the room don't allow additional windows or skylights, there are other ways to brighten the room. Unless your attic is cavernous, try to stay away from dark colors or busy wallpaper patterns. When you have a long, narrow space, paint the far wall a dark color and the two longer walls a lighter shade. To even out the symmetry of the room, try a light color for the walls and a darker shade of the same color for the floors. If you're installing windows or skylights, plumbing, or you need additional wiring, you're going to have to have a professional do the work to make sure your new space is safe and up to code. You may think that hiring an architect is an unnecessary expense, but they can be worth the price in terms of their expertise, contacts and creativity. They also know how to get the job done on a budget without sacrificing the results. When you're ready to build, contact a few local remodeling contractors to get an estimate. Most companies will provide you with a free initial consultation, and they may have some good ideas regarding things that a non-professional overlooks. In terms of ROI, the added value and function to your home will pay dividends for years to come.